Comfortable villa with sea and mountain views. Four rooms: three bedrooms and a spacious living room with a fireplace. Large terraces, swimming pool. Beautiful nature surrounds the house. The villa is located in Edremit, upper Kyrenia, one of the the most developed city of Northern Cyprus. Solid, two-storey villa with large terraces. The terrace offers a view of the sea and mountains. There is a large swimming pool, pergola, a place for barbecue. 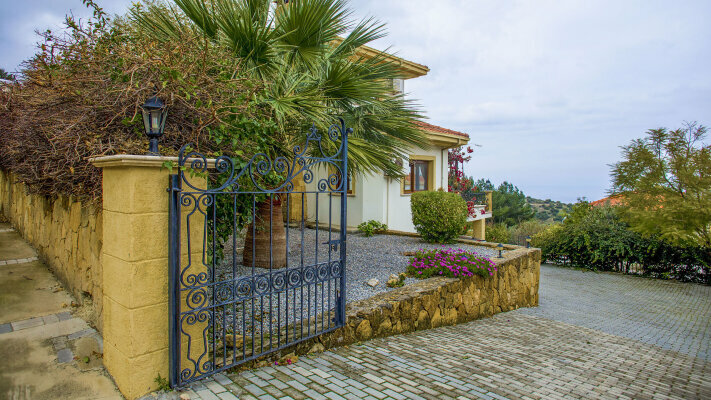 Beautiful location in the foothills, near the sea and sandy beaches. This villa has very good and functional layout. Three comfortable bedrooms, a spacious living room with a fireplace. Very good quality of construction, marble floors.